The renaissance guitar emerged in the early 16th century, and largely fell out of use in the mid-17th century, when larger, 5-course guitars became popular. It's a delightful and extremely versatile instrument. It has four courses (gg' c'c' e'e' a), and a string length of 484mm. 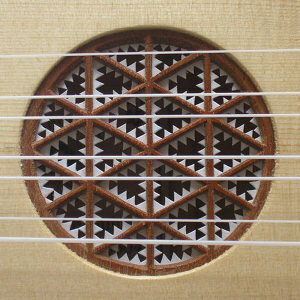 It's smaller, easier to play, and more portable than a lute or vihuela. It has its own small, attractive repertoire of lute-like pieces in tablature, but it also responds very well to strumming, providing a solid but prominent accompaniment to other instruments. My renaissance guitars are based on various paintings and illustrations, including the precise scaled drawing in Michael Praetorius's "Syntagma Musicum" of 1612. This is a rather odd instrument, having 6 courses and a carved head, but it provides the most accurate evidence for the body shape of a renaissance guitar. I usually construct the body and neck in maple, with a spruce or cedar soundboard. Bridge, pegs, etc. are in walnut. Fingerboard is yew. This, of course, can be modified to your specification.